The award of contracts for the remediation of some contaminated sites in Ogoni, Rivers State, without the implementation of emergency measures recommended by the United Nations Environment Programme (UNEP), has triggered fresh public outrage.For a people that have over four decades battled with life-threatening ailments, including cancers, respiratory disorders and sundry medical conditions, as well as food safety concerns, the decision of the Federal Government to deviate from the UNEP recommendations is considered unconscionable, stakeholders observe. The Hydrocarbon Pollution Remediation Project (HYPREP), which is saddled with the implementation of the environmental remediation measures proposed by UNEP in the environmental assessment of Ogoni Land, recently awarded contracts to 21 companies to carry out remediation in some of the contaminated sites. Already, 16 of the contractors have commenced works in 16 sites spread across four local councils. It would be recalled that in August 2011, UNEPâ€™s environmental assessment of Ogoni Land found that oil contamination from over 50 years of oil operations in the area had penetrated deeper than many thought. The restoration of the area after extensive environmental abuse, according to UNEP could prove to be the worldâ€™s most wide-ranging and long term oil cleanup exercise ever undertaken, if contaminated drinking water, land, creeks and important ecosystems such as mangroves are to be brought back to full, productive health. In the course of conducting its assessment, the UNEPâ€™s scientific team examined more than 200 locations, surveyed 122 kilometres of pipelinesâ€™ right of way, and reviewed more than 5, 000 medical records. In addition, detailed soil and groundwater contamination investigations were conducted at 69 sites, which ranged in size from 1, 300 square metres (Barabeedom-K.dere, Gokana Local Council to 79 hectares (Ajeokpori-Akpajo, Eleme . Altogether more than 4, 000 samples were analysed, including water taken from 142 groundwater monitoring wells drilled specifically for the study and soil extracted from 780 boreholes.UNEP had discovered in, at least 10 Ogoni communities where drinking water is contaminated with high levels of hydrocarbons, a development, which threatens public health seriously. For instance, at Nisisioken Ogale, the report revealed that families living close to the Nigerian National Petroleum Company (NNPC) pipelines have been drinking water from wells that are contaminated with benzene- a known carcinogen-at levels over 900 times above World Health Organisation guidelines. While UNEP clearly stipulated the operational recommendations for addressing the widespread oil pollution across Ogoni Land, it specifically recommended that the contamination in Nisisioken Ogale warrants emergency action ahead of all other remediation efforts, in order to protect human health and reduce risks to affected communities. UNEP equally identified some emergency measures, which warrant immediate action before anything else is done. These included: ensure that all drinking water wells where hydrocarbons were detected are marked, and that people are informed of the danger; provide adequate sources of drinking water to those households whose drinking water supply is impacted; people in Nsisioken Ogale, who have been consuming water with benzene (over 900 times above WHO guidelines) are recorded on a medical registry and their health status assessed and followed up. Others include initiating a survey of all drinking water wells around wells where hydrocarbons were observed and arranged measures 1 to 3 as appropriate based on the results; post signs in areas where hydrocarbons were observed on surface water warning people not to fish, swim or bathe in these areas and to advise all families whose rainwater samples tested positive to hydrocarbons against consuming the water, and mounting a public awareness campaign to warn individuals who are undertaking artisanal refining that such activities were damaging their health. Worried that HYPREP had not addressed these emergency issues before proceeding to the cleanup of some contaminated locations, Ogoni elders under the aegis Gbo Kabaari Ogoni, said this is contrary to governmentâ€™s claim that the implementation of the report will be done holistically and in a manner that ensures â€œtransparency and accountability. According to the chairman of the group Senator Bennett Birabi, since June 2, 2016 that Vice President Yemi Osinbajo flagged off the Ogoni cleanup exercise nothing has been done about any of the emergency measures recommended by UNEP. Birabi explained that after International Oil Companies (IOCs) first announced the release of $10m for the Ogoni cleanup, about N1b contract was awarded to each of the three consultancy firms. He noted that similar release of funds by the IOCs has again been followed up with a rash of contract awards that, amongst other things, debase and negate the concept of local content. â€œRather than commencing the implementation of the UNEP recommendations with the proposed emergency measures, what we have come to observe, and much to our chagrin, is that after each tranche of funds release by the oil companies on the cleanup project, the expenditure pattern, which is not only opaque changes, and the contract awards are carried out in such a manner that not only undermines the smooth implementation of the project, but is completely out of sync with the UNEP recommendations,â€ he said. The Gbo Kabaari Ogoni leader stressed that it was wrong for HYPREP to award contracts for cleanup when a comprehensive decommissioning of oil facilities that failed an â€œasset Integrity had not been done.â€ He also wondered why the rush to commence cleanup when an Integrated Contaminated Soil Management Centre, comprising an incinerator, thermal unit, soil washing unit and a contaminated water treatment unit was yet to be set up in Ogoni. â€œIn 2017, the then Environment Minister, Amina Mohammed, at an impressive public event that was widely reported in the press did a so-called â€œgroundbreakingâ€ ceremony of the Integrated Contaminated Soil Management Centre at the School-To-Land Farm in Bori, a site that is now overgrown with bush.â€ He declared that based on credible information, the current cleanup exercise is only, but a preliminary phase intended to show that something is being done all in a bid to fraudulently exploit national and international visibility of the Ogoni issue to score cheap public relations benefits. But HYPREP Project Coordinator, Dr. Marvin Dekil, insisted that in line with the emergency measures recommended, HYPREP carried out a medical outreach in two phases; first in 2017 and 2018 in Gokana, Tai, Khana and Eleme local councils, where patients with various medical conditions were attended to, and even surgeries carried out. â€œAbout 20, 000 patients were treated with over 400 surgeries carried out. This very important activity of HYPREP achieved two purposes. First, it provided medicare to the people. Secondly, it provided an initial data gathering avenue for health studies,â€ he said. Dekil told The Guardian that HYPREP has done a mapping of all water facilities in Ogoni Land and has commenced the procurement process. This has been corroborated by a member of HYPREP governing council and former provisional president of MOSOP, Professor Ben Naanen, who explained that HYPREP was presently doing more than even what UNEP had recommended, especially as it concerns the provision of potable water for impacted Ogoni communities. He stressed that it was one thing to make recommendation on paper and another thing to implement it particularly when there were certain practical changes that are to be effected. â€œShell and the Rivers State government initially supplied water to some of these communities with tankers. That process was not sustainable. And so what we have done at the governing council is to look at the whole water supply situation in Ogoni and work towards providing water in every part of Ogoni, and not to use tankers to supply water to the impacted communities. So, we approved a comprehensive water scheme for the whole of Ogoni. It includes the rehabilitation of all existing water networks put in place by the state government and other agencies that are not working. In fact, no water system in Ogoni Land is working and so we have to rehabilitate them,â€ Naanen said. He added: â€œThat, definitely was not in UNEPâ€™s report. All that the UNEP report said was to provide emergency water. They did not say how we were going to do it. But now, we have devised a programme for the whole of Ogoni Land, and not just an emergency thing, but something permanent. Should we continue to carry water in tankers to these communities? It is not practicable and sustainable, which is what Shell did initially and it failed. So, we do not want that approach, so contracts have been advertised and are being processed.â€He explained that if HYPREP pays attention to Gbo Karaabi Ogoni insistence of adherence to UNEPâ€™s recommendation, the implication is that the whole of Ogoni will not get potable water supply. The former MOSOP leader dismissed the claim that the whole process had not been transparent, pointing out that when bids were advertised and contracts awarded all members of the governing council were aware of this. According to him, â€œeverything was open. Some of us will not be there and support something that is opaque and they know it. We are people who are not going to accept certain levels of behavior.â€Naanen, however, acknowledged that artisanal refining still remains a challenge in Ogoni Land though not as prevalent as it used to be because of the sensitisation that is being done by HYPREP. Bearing in mind that the UNEP report submitted eight years ago, with set of recommendations considered as emergency at the time, Dekil said due to the over six-year delay in the implementation of the report, there was need to develop a new strategy for implementing all the recommendations such as provision of water, health, and land remediation simultaneously. â€œBy this approach, we have concluded the process for selecting remediation companies, which have now been deployed to sites. There are ongoing procurement activities for selecting water companies, which will soon to be deployed to sites, as well as procurement activities for health companies. Dekil explained that the integrated soil management is a centre that would be built to address highly impacted soil materials, adding that for now, all the sites that have been treated are not sites that have highly impacted materials.â€œAfter an eight-year delay, it is time for serious work, and we needed to come up with a strategy that will allow us to start work immediately so that some of these locations could be remediated for farmers to go back and start farming, and that is why we are doing this. The sites we are remediating do not require a soil management centre. â€œHowever, in the subsequent ones, we would have completed the centre, and the feasibility study for that centre is on. An international competitive bid will also be advertised,â€ he added. Considering the fact that the release of the UNEP report eight years ago remained a landmark event in the history of environmental movements in Nigeria, and of a people demanding environmental justice, a faction of MOSOP led by Fegalo Nsuke, said that not implementing the emergency recommendations was like to partaking in the misdeed of predatory multinational oil companies, which for their commercial interests, willfully violated environmental norms in Ogoni Land. Nsuke said the massive deaths recorded in Ogoni Land have become intolerable and the issue of delays in water provision can no longer be tolerated. He stressed that the situation in Ogoni demands that water provision be given top priority in order to provide an alternative to the poison that people presently consume. â€œHYPREP is not prepared for this cleanup because the Integrated Soil Management Centre, which should handle the massive wastes from the polluted sites is not in place and the provision of water, which should be treated as an emergency has been seriously degraded. What HYPREP is interested in right now is how to spend the cleanup funds meant for Ogoniland ahead of the 2019 elections and that is not acceptable to us,â€ said Nsuke. He further threatened that if HYPREP fails to commence the Ogoni water project before February, he will mobilise a massive civil protest against the outfit in Ogoni.â€What HYPREP is doing is a scam. There is no way you can commence such a massive exercise without providing an alternative source of drinking water and having a way to manage the wastes. The report says that there should be an integrated soil management centre in place to manage the wastes from the sites, but HYPREP now wants to turn our communities into dumping sites and we will resist that very strongly,â€ he said. The Research/Project Officer, Energy and Climate, Social Action, Dumnamene Fyneface, whose group has been monitoring the cleanup by HYPREP said the absence of a contaminated soil treatment centre, which was strongly recommended by UNEP, as well as, Centre of Excellence smacks of unseriousness on the part of HYPREP. Fyneface criticised HYPREP for reneging on its promise to re-assess oil contaminated sites in Ogoni in order to determine the current level of pollution after the 2011 UNEP report. He acknowledged that HYPREP in 2017 called for expression of interest by competent companies to carry out the re-assessment of sites assessed by UNEP and those not assessed by the agency. â€œIt would, however, interest you to know that, till date, HYPREP has not awarded contract to any company to reassess polluted sites in Ogoniland that they claimed was partly responsible for the delay of the Ogoni cleanup, but has gone ahead to advertise again in 2018; called for expression of interest; opened bids and preparing to award contracts for the commencement of its mirage cleanup in December 2018,â€ he said. Social Action regretted that since the flag-off of the Ogoni cleanup exercise, HYPREP has rebuffed and indeed failed to publish the cleanup implementation framework/work plan despite repeated requests by civil society and community groups to enable them monitor the process. It said there have been strong doubts in several quarters as to whether the document does not exist, and by extension, whether there even exists a framework or plan for the cleanup. â€œThe Federal Government should critically address the alternative livelihood issues and â€œfast trackâ€ the Ogoni cleanup as planned since August 2015 to save the lives and health of Ogoni people who depend on, and live in the polluted environment daily,â€ said Fyneface. Celestine Akpobari, a member of Ogoni delegation to a two-day stakeholders meetings held in Geneva in November 2014, which cleared the path for the implementation of the UNEP report, said though HYPREP is not a perfect agency, its critics would have done better if they channeled their energies to pressurising the Federal Government to increase its funding. â€œI was part of the delegation to Geneva from the country during the Goodluck Jonathan-led administration, and up to this period, and so I know that the process no doubt has been slow. But something has happened since that time. For instance, the governance structure has been settled, and HYPREP now has money in its account to do one or some things both for water and the remediation. Some sites have also been handed over to contractors. I know that Amina Mohammed laid the foundation for the soil management centre, but I donâ€™t know why that has not taken off, as well as, the centre for excellence. I know that the $200m we negotiated to be realised annually cannot do all the jobs at the same time, but I know they will do it,â€ he said. Akpobari who is the founder of Ogoni Solidarity Forum, urged Ogoni stakeholders to have confidence in the process because UNEP is also keenly monitoring the entire implementation of the cleanup programme.He revealed that HYPREP decided to embark on the remediation of some not intensively contaminated sites in Ogoni because of pressure from those, who are now accusing it of wasting time to commence the cleanup. â€œHYPREP is doing this because of too much noise about the cleanup. This stage for me is supposed to be the last stage, but people were saying nothing is happening. But I know that our land is devasted; I know that the level of pollution in Ogoni when that report was submitted is not the same today, and that was why the HYPREP coordinator started recruiting Ogoni people that are masters on environmental matters to start collecting samples, that is the most critical aspect, but they donâ€™t count all that as progress made. I know that HYPREP has been under pressure and that is why it has decided to do remedial works on these sites that pollution is not intensive. I know that when it comes to the intensive sites, there is no way they will carry out remediation without a soil management centre in place,â€ he said. Signs that crisis could be brewing in Ogoni over the cleanup exercise includes the petrol attack on a HYPREP bus. 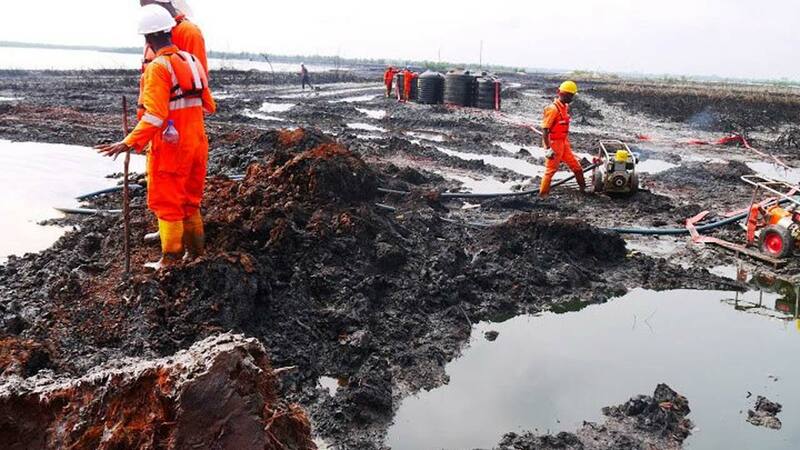 This incident, according to sources in Ogoni underscores growing discontent in the area.The Rivers State Governor, Nyesom Wike has severally expressed regrets that the Ogoni cleanup exercise has been politicised, and the Ministry of Environment handed over sites to contractors three years after Osinbajo flagged off the exercise. â€œThree years ago, the President represented by his vice flagged off the cleanup during the rerun elections. One month to the general elections, the Minister of Environment has come to hand over the sites. If I tell you I believe sincerely that you people want to cleanup Ogoni Land, I am telling you lies. Surprise me and prove me wrongâ€, he said. He equally urged the Minister of Environment, Mr. Suleiman Zarma, to investigate cases of deduction of funds from contracts awarded for the cleanup exercise.